Naomi and Art Patershall’s infatuation with a castoff from the heyday of American cars began with regular trips past a neighbor’s house. “We would drive by his carport and look at his Edsel (a 1958 Pacer) all the time. He and my husband worked out a trade and Art got it all fixed up,” Naomi said. The Hillsboro couple’s foray into Edsel ownership grew to include membership in the Oregon Edsel Owners Club, of which Naomi is now the secretary. From July 31 to Aug. 5, the Edsel Owners Club will be hosting its convention in Keizer, bringing together owners from throughout the country and Canada. It’s the second time in the past decade Edsel owners have chosen Keizer for their hub, but this time around will be particularly special, said Patershall. “The Oregon Club is celebrating its 50th anniversary, and the car has only been around for 60 years,” she said. Ford produced Edsels between 1958 and 1960. Fewer than 10,000 of the 116,000 produced are believed to have survived. For more about the car and its place in infamy, see related story on this page. Choosing Keizer again was easy despite looking at other locations along Interstate 5, she added. “The hotel was really good to work with the last time we were there and Keizer is a good location to launch side trips that take us through covered bridges and the agricultural areas,” Patershall said. The group plans to visit the Albany Historic Carousel and Museum and Powerland Heritage Park among other activities. Keizerites will also have opportunities to gawk at the club’s crown jewels. Early arrivers plan to visit Sonic Drive-In on River Road about 5 p.m. on Tuesday, July 31. 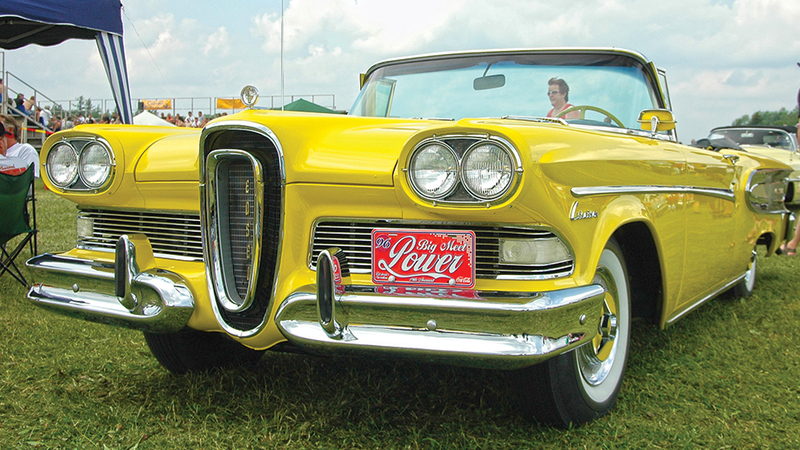 On Friday, Aug. 3, the club will host an all-Edsel car show beginning at 9 a.m. in the Quality Suites parking lot. Professional judges will be handing out awards in several categories, but attendees will have the opportunity to vote on for the audience award. The one topic that is sure to come up is how and why the cars they now love were snubbed so hard when they were widely available. “Club members debate at length about why it failed. Every time we get together,” Patershall said.